There are an estimated 1.57 billion Muslims – nearly a quarter of the world’s total population. 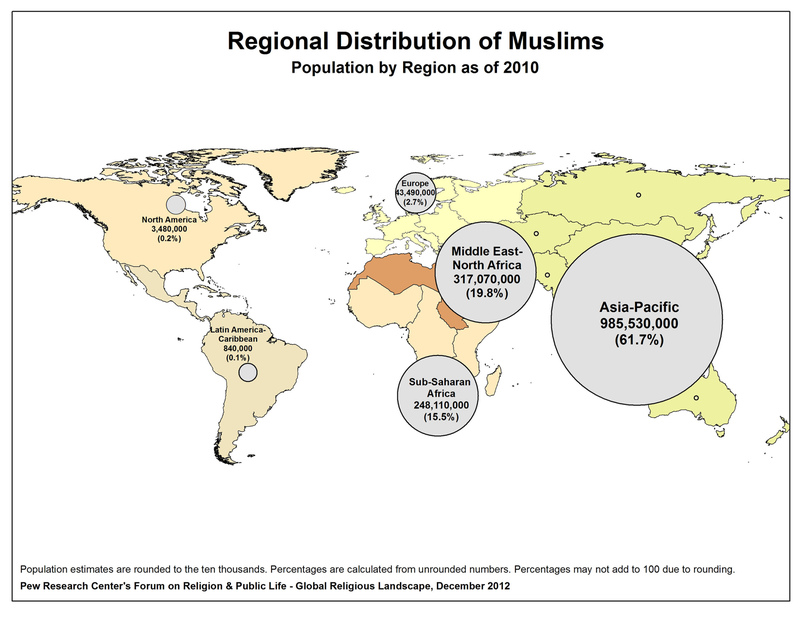 While Muslims are found on all five inhabited continents, more than 60% of the global Muslim population is in Asia and about 20% in the Middle East and North Africa. However, the Middle East-North Africa region has the highest percentage of Muslim-majority countries, more than half of which are 95% Muslim or greater. Of the total Muslim population, 10 to 13% are Shia and 87 to 90% are Sunni. Most Shias live in Iran, Pakistan, India and Iraq. Cornell University Library Map Collection. 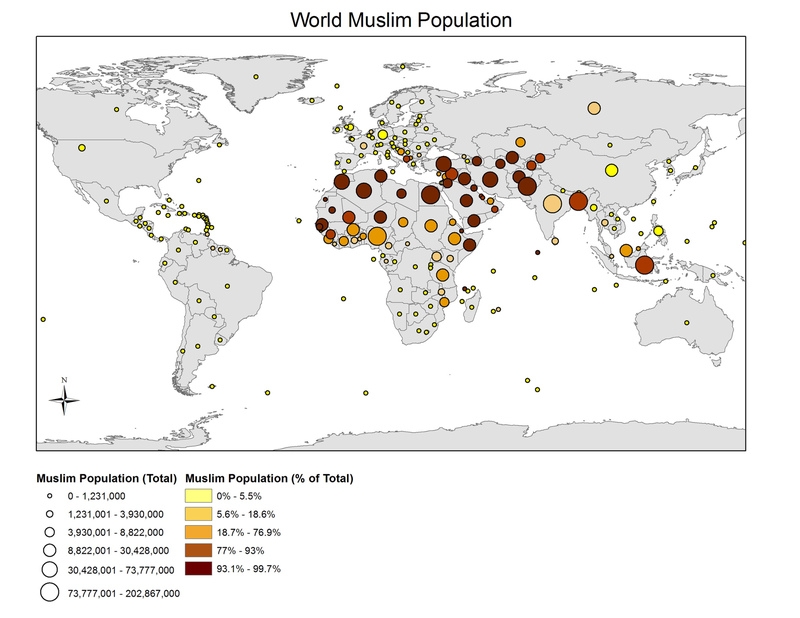 World Muslim Population (2010) [map]. 2016. 1: 130,026,777; generated by Martin Ziech; using ArcView GIS 10.4.1 [GIS software]. Redlands, CA: Environmental Systems Research Institute, 1992-2016. Cornell University Library Map Collection. 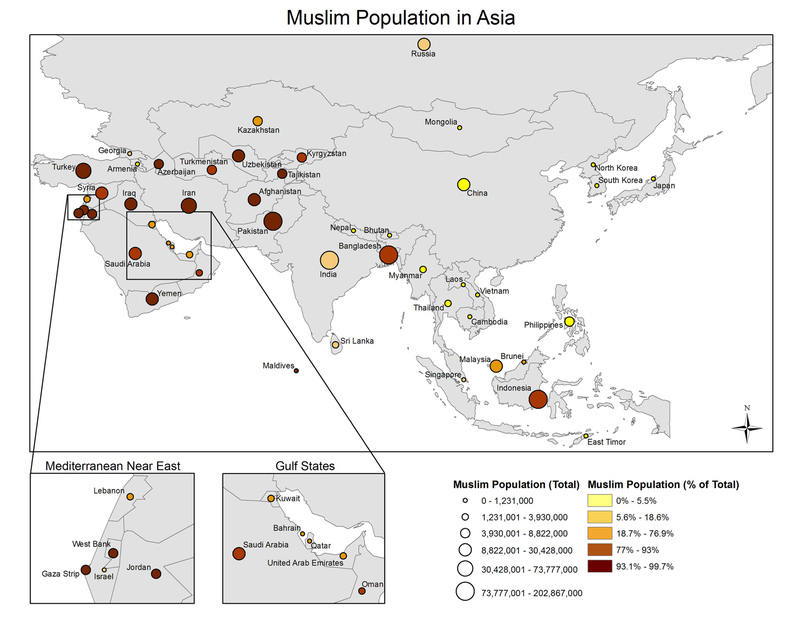 Muslim Population in Asia as Percent of the Total (2010) [map]. 2016. 1: 65,434,633; generated by Martin Ziech, Boris Michev; using ArcView GIS 10.4.1 [GIS software]. Redlands, CA: Environmental Systems Research Institute, 1992-2016.